Pavers are landscape elements laid on flat surfaces, most often made of stone or stone-derived materials. 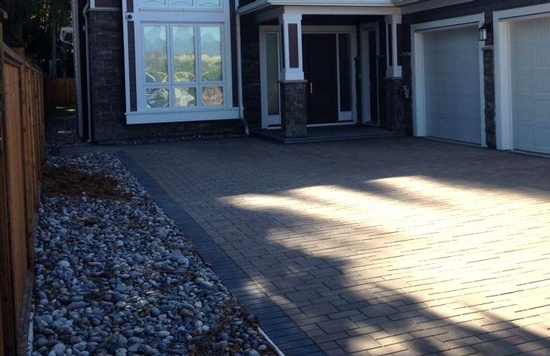 Pavers are installed over a sand and/or crushed limestone base. They are often laid out in interlocking patterns, sometimes randomly to create an artistic effect. They are known to have a functional values as well as an aesthetic appeal, so you can add them as a finishing touch to complete your overall landscape projects. They don't crack and often they are affordable than concrete. They are easy to repair if a settlement occurs. We can use them in your new driveway, sidewalks, around the swimming pool or creating an Outdoor living space is another way to add to the value of your home. A flagstone or paver patio can complement your home without the expense of maintaining a wood deck. There are many shapes and sizes of stones to make each patio unique to your home. Based on your specific application and preferences, we will make a recommendation for you. A well done outdoor living space will not only increase the value of your home but will allow you to entertain with ease. Allow yourself to escape to your new patio and enjoy your landscape for true relaxation. we can supply all the components you need to create the garden of your dreams. We serve clients across Surrey, Burnaby, Vancouver, Richmond, Coquitlam, Maple Ridge, North Vancouver, and West Vancouver, British Columbia and rest of the Lower Mainland.